GISWeekly examines select top news each week, picks out worthwhile reading from around the web, and special interest items you might not find elsewhere. This issue will feature Industry News, Top News of the Week, Acquisitions/Agreements/Alliances, Announcements, New Products, Around the Web and Events Calendar. display settings in a map. “The display manager is a tool for accessing all of the styles in your map from a single floating window, greatly increasing the users ability to start using Maptitude right-away,” explained Stewart Berry, Maptitude product manager and GIS Specialist for Caliper. For people who want to go beyond the basics, there’s the extensive online help plus a hard copy manual shipped with the product that includes many quick starts and tutorials. Customers range from the Census Bureau who use Caliper’s mapping software to manage the next round of geography creation for the Census, to those in many sectors including banking, public health, community development, retail, real estate, sales and marketing. facilities located on a map to partition the streets into their own trade areas based on travel time or costs across the street network. This allows you to create territories based on the streets rather than just areas. Other new features include more flexible legends, improved thematic mapping, a geocoding tool for cities in the US and internationally, and file format compatibility with ESRI personal geodatabases, MS Access, Excel 2007, JPEG 2000 and Google Earth. 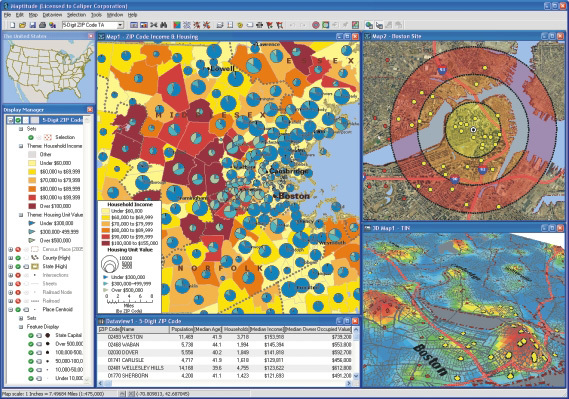 Maptitude is compatible with Microsoft Windows 2000, XP and Vista, as well as many other GIS and database software. With Maptitude you can connect to Google Earth so that you export a map image out of Maptitude and see it located in Google Earth. Alternatively, you can take a Google Earth image and see it as an image layer in Maptitude. “We also allow you to export to KML or KMZ so you can take your entire map and export every layer and then be able to open Google and manipulate those layers within Google,” Berry said. Programmers will note that the Maptitude GISDK language now supports object-oriented programming, and Maptitude 5 is .NET enabled. Pricing: A single license is only $495. Discounts are available for 10 or more copies. Caliper GIS software is used by more than 50,000 users in over 70 countries. 3001 has been awarded an indefinite delivery contract (IDC) for photogrammetry, GIS, and related services by the U.S. Corps of Engineers (USACE) Huntington District. The IDC has a maximum value of $3 million dollars ($3M) over a one-year period, with two option years. This contract will support USACE civil works projects primarily within the boundaries of the Huntington District, but may extend throughout the Great Lakes and Ohio River Division (Alabama, Georgia, Indiana, Illinois, Kentucky, Maryland, Michigan, Minnesota, New York, North Carolina, Ohio, Pennsylvania, Tennessee, Virginia, West Virginia, and Wisconsin). Telvent Miner & Miner announced the availability of the ArcFM Solution version 9.2.1. The ArcFM Solution assists electric, gas, water, and wastewater utilities in editing, modeling, maintaining, and managing facility information. ArcFM Solution 9.2.1 is certified with ESRI's ArcGIS 9.2. (CSA) to establish sites in Canada to monitor the Galileo GIOVE test satellites. Galileo is the European Union's state-of-the-art Global Navigation Satellite System. The work includes a parallel cooperative effort to integrate the NovAtel Galileo Test Receiver (GTR), developed by NovAtel for the CSA, into the GIOVE-A Galileo Experimental Sensor Station (GESS), to upgrade the GTR capabilities and to field these GESS stations in Canada. SpotOn Systems have signed a strategic agreement to provide Cognos customers throughout North America with the ability to create on-demand interactive map-enabled reports. Under the agreement, SpotOn Systems has integrated Cognos BI solutions with Integeo’s award-winning Map Intelligence, a rapid application development platform that enables organizations to quickly build custom location intelligent solutions without any programming. Leica Geosystems Geospatial Imaging announced that Merrick Advanced Photogrammetry of the Americas S. de R.L. de C.V. (MAPA) is now the master distributor of Leica Geosystems solutions to customers in Mexico. Based in Guadalajara and Mexico City, Mexico, MAPA is a leading provider of photogrammetry, LIDAR, satellite imagery and mapping products and services. 1. Educational Achievement (formal and informal courses and conferences related to geospatial and GIS technology). 2. Professional Experience (professional positions involving GIS). 3. Contributions to the Profession (professional and personal activities designed to elevate and promote the GIS profession to others). Open Geospatial Consortium, Inc. (OGC) have approved version 1.0 of the OpenGIS(R) Observations & Measurements (O&M) Encoding Standard. The O&M standard defines an abstract model and an XML schema encoding for observations and measurements. This framework is required for use by other OGC Sensor Web Enablement (SWE) standards as well as for general support for OGC compliant systems dealing in technical measurements in science and engineering. As a new international consensus standard in an era of increasing scientific cooperation, O&M promises to play an important role in Web-based publishing of real-time and archived scientific data across research disciplines and application domains. GCWare branches under the transnational YMS Group’s single roof signals a new direction in the IT market for special solutions using geographical information. Current operations in Dubai, London, Germany and China as well as comprehensive development firms in the Czech Republic and Slovakia have already been working and will be under the common YMS Group flag.